BoomBox embarks on their 2013 summer tour with festivals stops at Wakarusa, Bounce, Manifest, Electric Forest, Camp Bisco, Summerset and Equifunk. They will stop in the Midwest for a few club dates along the way and cap the summer off at Red Rocks supporting Lotus with Break Science and Minnesota. They are also spending time in the studio putting the final touches on their third release titled “Fill In The Color”. It will include all new, original songs and is being recorded using a blend of electronic programming and live instrumentation with Randolph on keys and Godchaux on guitar, bass and vocals and both performing drums on various tracks. The album will incorporate instruments and voices from the band’s live recordings as well. BoomBox is now touring with an extremely unique analog sound rig and with seasoned sound engineer Heath Bennett at the the helm they will provide a sonic experience that few other bands can replicate. Their new soundboard is an adapted TAC Scorpion, a vintage analog studio sound board that has been specially modified to deliver superior sound quality, richer warmer clearer tones, stellar stereo imaging and, most importantly, booming bass. BoomBox’s rig will also allow them to hear exactly what the crowd hears with unaltered quality, which is essential for the band to experience and adapt their set to match the flow and vibe of the room. It is also a fully functioning recording studio! So, not only do they have the ability to record every live show, but they can now record new tracks anywhere along their tour. 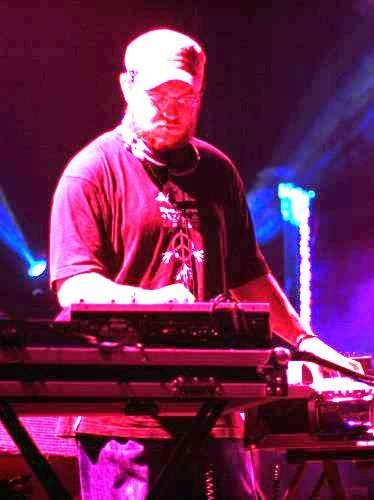 BoomBox is two versatile producers, DJs, songwriters, multi-instrumentalists and longtime friends Russ Randolph and Zion Rock Godchaux. Together they develop an electronic blend of vintage Rock and Blues made to move dance floors while incorporating their signature Backbeat, Psychedelia and Funky House sounds. Applying a multi-track platform, they are free to create their hybrid style on the fly with a rhythm that moves fans and opens them up to Godchaux and Randolph’s overall vision. Derived from the rich musical history of Muscle Shoals, AL, to the psychedelic rock and underground electronic scenes of the west coast, their unique approach can only be achieved by the blending of sound and culture. BoomBox’s first release, Visions of Backbeat, contained the breakout song "Stereo" that built the foundation for their rapidly growing fan base. After years of steady touring and honing their sound, they released their sophomore effort, downriverelectric, and it was hailed by critics as a progressive follow up effort. BoomBox are continuously working on new releases, using a blend of programming and live instrumentation with both members on drums, Randolph on keys, and Godchaux on guitar, bass and vocals.